Feroda 16 Beta runs on the W501P without any major concern. The only issue I found is the Gnome onscreen keyboard that does not work well. Despite the onscreen keyboard, I did not found any serious issue when using Fedora on Iconia Tab W501P. I did no testing with ATI proprietary drivers on Fedora. 1 - When I allowed the installer to download updates during installation, the X did not work very well after first boot. So I installed it again and it is working pretty well without allowing the packages to be updated. I'll wait untill ATI driver supports the C-60 GPU until allowing updates. 2 - The ATI proprietary driver does NOT work with C-60 GPU. I've tried Ubuntu's two packages, "AMD Catalyst™ 11.9 Proprietary Linux x86 Display Driver", and "AMD Catalyst™ 11.10 Proprietary Linux x86 Display Driver". When using Ubuntu's package, an stamp with AMD logo appears on the right bottom corner saying: "Unsupported Hardware". I would not recommend to try those drivers with Ubuntu 11.10. It may be necessary to re-install your Ubuntu. After learning about updates and ATI proprietary driver, I'm happy with Ubuntu on W501p. I'm curious about the performance gain by using the proprietary graphics driver. Will it be possible to play HD flash movies on full screen? I was curious about the sleep state power consumption. 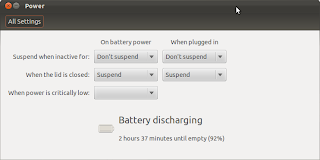 I've charged the battery, and asked Ubuntu to sleep the tablet. I removed the charged cord and waited exactly 12 hours. How many % of the battery power were consumed in 12 hours? 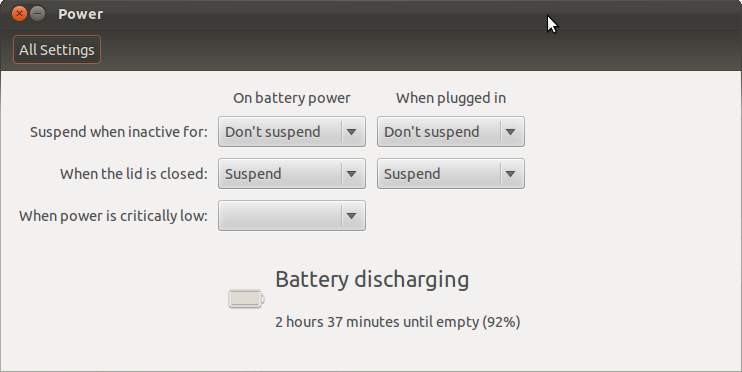 The result is that after 12 hours of sleep state the battery charge was informed to be 92% by Ubuntu. 8% every 12 hours means 16% every 24 hours. Looks like that the Iconia Tab W501P can stay sleeping for more than 6 days. This is good! Not tested yet battery life for usage. I think that this will be improved when the proprietary graphics driver is available.